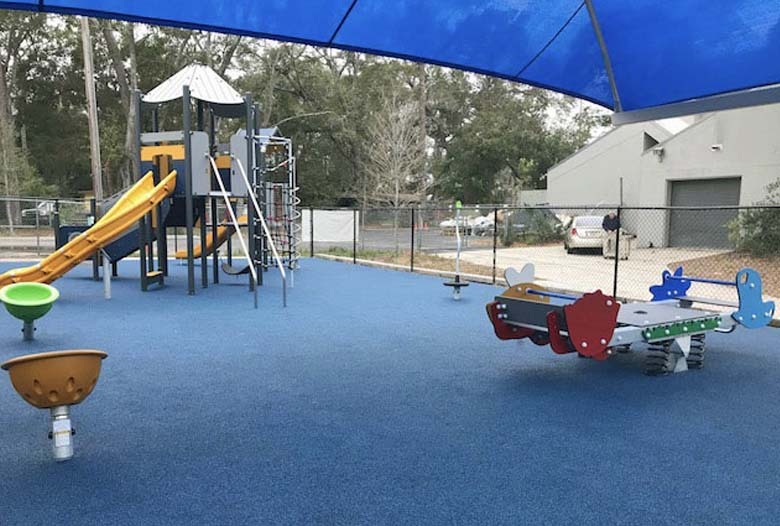 No Fault had the wonderful opportunity to partner with KOMPAN Playground & Fitness Solutions, and provided our rubber safety surface in a stunning blue color for the playground at Morning Star School in Jacksonville, Fla.
Stacy Moseley of KOMPAN worked with Morning Star School, a Catholic school for children with special learning needs. 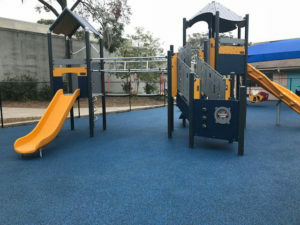 Her vision was to design and create a playground that speaks to the unique cognitive, emotional, social, and creative development of this student body. KOMPAN play equipment invites gross upper body muscle development, cross body coordination, spinning for vestibular stimulation/sensory integration, and rocking for group play and self-soothing. Stacy teamed up with No Fault to include our No Fault Safety Surface (poured-in-place rubber) that provides a soft touch surface for children who might have tactile issues and offers complete ADA accessibility. 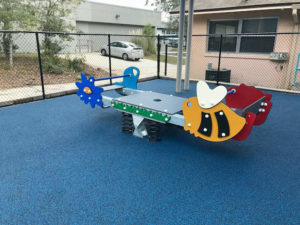 It also adds a colorful, aesthetic finish to this wonderfully designed playground area. Our customer was very pleased with the results! For more information about No Fault Safety Surface, please give us a call at 1-800-232-7766. What is ‘Critical Fall Height’ and Why Does it Matter? Does Longer Recess Mean Better Grades?